Well I'll be darned, old Mac the master radio repairman taught me something else new this month. Along with giving sidekick Barney a lesson on business ethics and how honest dealing can pay dividends as societal conditions change, he also put on his Sherlock Holmes cap and deduced a surprising cause for circuit failure based on the physical location of a lady's radio; read on to learn the details. As usual, the exact scenarios of the stories do not apply to today's environment and/or equipment, but the troubleshooting logic certainly does. 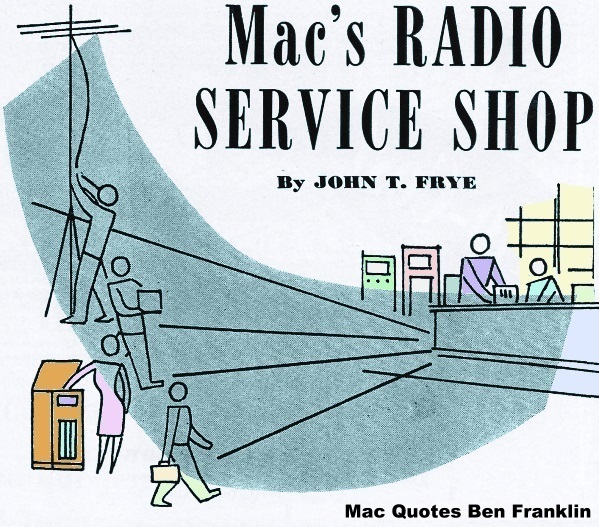 Now and then the lazy breeze that put just the final touch of perfection to the beautiful October Indian Summer afternoon wafted a slight odor of burning leaves into Mac's Radio Service Shop where the owner and his assistant, Barney, were busily at work at the bench. Suddenly the red-headed youth dropped his alignment screwdriver and pointed an accusing finger at the chassis on which Mac was working. "Oh, oh!" he said triumphantly. "I saw that! Here you have been lecturing me on making neat solder joints, and just look at what you are doing: You cut the lugs loose from that twist-prong electrolytic without unsoldering the wires, and now you are soldering them right onto the lugs of the new condenser. Do you call that a neat-looking solder job?" "A foolish consistency is the hobgoblin of little minds," Mac resignedly quoted to himself as he turned the a.c.-d.c. chassis upside down and shook it vigorously to make sure no loose particles of solder remained inside to cause trouble. "Well, Junior," he said as he put the set aside, "I must admit that I am not practicing what I preached. I did tell you that you should make each solder job look as nearly like the factory solder joints as possible, and I must confess that those connections I just made are not things of beauty. "However, there are some extenuating circumstances. In the first place, look at how cramped for room this chassis is. Parts are crowded and jammed into every square inch of space so that there just is no room left for maneuvering a soldering iron and the needle-nose pliers. Note, too, that the condenser lugs are used as tie­points for much of the wiring of the set. Each lug has several wires going to it, including two or three paper condenser leads. "Now if I took the time to remove each wire, I should have to spend many more minutes on this job; furthermore, unless the lugs could be made absolutely free of solder and perfectly straight, it is most likely that I should have broken the Bakelite mounting socket in trying to remove the old condenser. On top of that, in wrestling around the leads of the paper condensers, I would be almost certain to break one loose from its foil; or one of the wires would break off too short and have to be replaced. "When I told you to make a 'good-looking' solder joint, my main concern was to see that you made a 'good' joint. I knew that if the solder flowed smoothly around the wires, and if there was no excess of solder or rosin to mask the actual connection, the chances would be excellent that the joint was electrically all right. See what I mean?" "Yes; it is the same thing our biology teacher used to tell us. Nature causes men to go for pretty girls and girls to like handsome men because beauty and health usually go together. The beauty is not important in itself but for what accompanies it. Did you ever notice how healthy I am?" Barney asked as he thumped himself vigorously on the chest and then subsided into a fit of coughing. "A fine physical specimen," Mac agreed dryly; "but to return to the subject, did you notice that I took care to loop one wire of each tie-point through both old and new lugs so as to make each joint mechanically solid before flowing the solder? I made sure that every one of those joints was solid as a rock, even though they do have their aesthetic shortcomings. "The whole point is that the customer gets just as good a job with this method for less money than he would if I removed and replaced each wire separately. In addition to the extra time for which I should have had to charge him, he would quite likely have had to pay for one or two paper condensers ruined by tugging and twisting its leads; more­over, I have learned from long experience that the less the wiring and parts of a set are disturbed the smaller is the likelihood that it will develop new troubles. Especially is this true in the case of an older set, like this one." "Yes, but I thought you wanted to make money. If you spend more time on a set and put in more parts, you make more money, don't you ?" "You make more on one set, but you lose out in the long run," Mac replied. "Do you remember what old Ben said ?" "Benjamin Franklin, who might be called the daddy of radio since he used a kite string for an antenna and his knuckle for a receiver in proving that lightning was electricity. He had as much horse-sense as any American in history, and he said, 'Honesty is the best policy.' Mull that over a bit. He was not advising that you be honest because it was the moral thing to do or because religion taught that you should. He simply meant that consistent, unvarying honesty is good business; and it is." "You mean that when you are working on a set you ought always to be thinking of the customer's interests?" "Exactly. You should always be trying to put the set into the best possible condition in the least possible time." "Even when you are charging by the hour? How are you going to make any money that way?" "By turning out more sets in a day. Suppose, for example, you have a shop and turn out ten sets a day, while I turn out fifteen. Both of us charge the same hourly rate; so it might seem that I am getting the worst of it, inasmuch as I am doing more work for the same money you get; but just remember that the cost to my customers would be, on the average, only two-thirds as much as you charge them. Assuming that we do equally good work, which one of us do you think will be getting the most of the business ?" "Yeah, but how about it when times are tough and there aren't so many sets to service. Won't your cut-rate business backfire then?" "There is nothing cut-rate about it. Remember we charge the same hourly rate. Individual charges are brought down by increased efficiency, just as they are in our mass-production factories. When times get tough - and I speak from experience during the last depression - customers are all the more likely to patronize a shop that can turn sets out cheaper because it turns them out faster. Trying to get more money out of fewer sets is the same type of foolish action that the man took when he killed the goose that laid the golden eggs; and, in time, it wilt end just as disastrously." "Is that just an opinion, or can you cite an example." "There is plenty of proof all around us. During the war, when there was a lot more service work than normal, several fellows around here - some new to the game and a few, I am sorry to say, old-timers - fell for the temptation of easy money. People were willing to pay almost any price to keep their irreplaceable sets going, and these fellows took advantage of these conditions. They charged all that the traffic would bear, and they were slovenly and lazy in their work. Instead of doing all the good work they could, they did about half of that and made up the difference in overcharges. "Now things are rapidly changing. 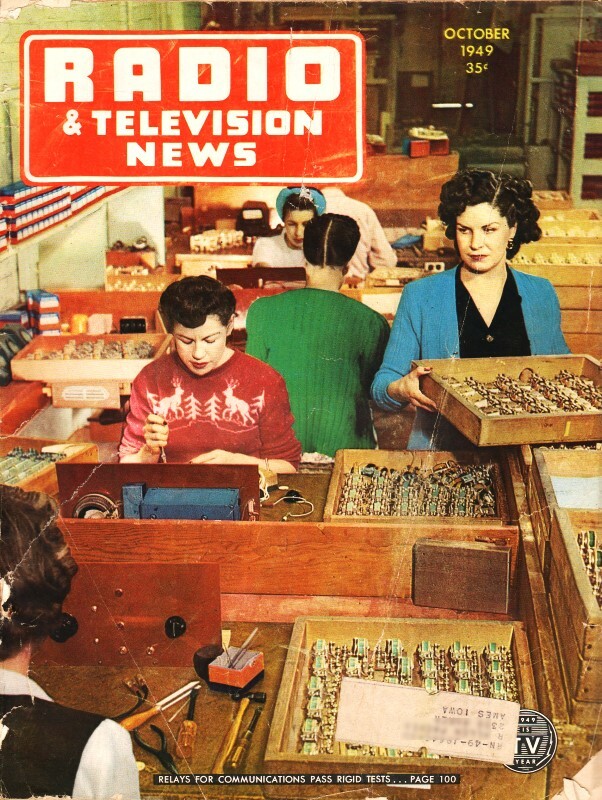 New sets are plentiful; competition is more keen; people are watching their nickels and dimes more carefully. As a result, we see the boys who belonged to the 'pour it on' school are beginning to fold up and go out of business. The customers who had to put up with their poor service during the war are now in a position to be more choosey. By the same token, the shops that played square with the customers when they could have taken advantage of them are still covered up with work." "Okay! So you and Ben have me convinced that the way to be a success in the service business is not to see how much money you can squeeze out of each set, but to see how many sets you can squeeze into a day's work. And now let's change the subject. "The owner of this set complained that it was noisy when tuned, and it was. Blowing out the condenser plates with the air-jet took care of that, but I noticed on the job record card that we had the same set on the same complaint last March. It doesn't seem to me that it should get dusty that soon. The condenser plates are well spaced, and they don't look very dirty. It just seems that the dust that is in there is of a kind that does an exceptionally good job of shorting out." Mac rubbed a finger across the chassis and then rubbed the dust picked up between his finger and thumb while he looked at it closely. Next he glanced at the job card, picked up the telephone, and dialed a number. "Mrs. Brewer," he said when the party answered, "this is Mac's Radio Service Shop. I am wondering if your little radio that we have in the shop could possibly be used in your home in a spot that is near a steam radiator. On a shelf in the bathroom directly over a radiator, you say? And is the radiator painted with metallic paint? It is? Well, Mrs. Brewer, I suggest that you try to find some other position for the set. Not only is it bad to have your set in a spot where it is likely to become so warm, but in this case tiny particles of the metallic paint are being carried upward from your radiator by convection currents and are lodging between the plates of your tuning condensers, causing them to short out. That is what made the noise when you turned the dial. If you leave your radio there, it will have to come into the shop every few months to be cleaned. That will be fine, Mrs. Brewer; you are quite welcome." "Oh me!" Barney groaned as Mac hung up the receiver. "Not only do I have to be honest like Ben Franklin and tell my customers how to keep their sets out of my shop; but I have to make like Sherlock Holmes and be able to feel the dust on a set and tell where it sits in the owner's home! Why didn't I take up something easy, like ditch-digging?"